Hey guys! 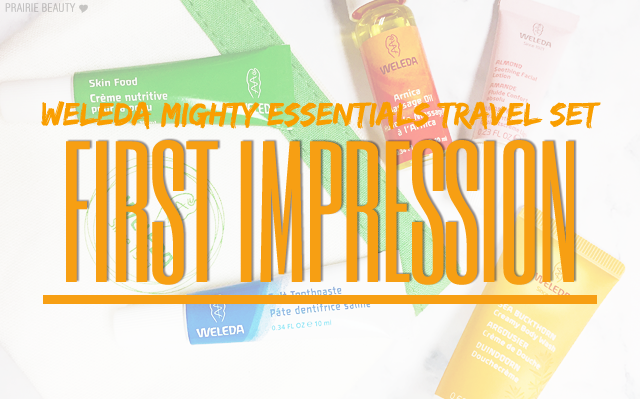 Recently I got the chance to try out the Weleda Mighty Essentials Travel Set*, which includes 5 of their must have products. Even though this set isn't available anymore, I wanted to give you guys my first impressions on the products included in it because I think there's some winners in the bunch that a lot of people would really enjoy - including a ride or die, long time favorite product of mine that I recommend constantly. Using this toothpaste is definitely a new experience for me. It really does remind me of what it would be like to brush my teeth with salt water, except that my teeth do feel clean and my mouth does feel fresh after - even though I do find myself missing the mintiness of traditional toothpaste. I'm not sure I'll personally be moving over to this toothpaste, but I definitely think a lot of people who are looking to go more natural with their toothpaste would really enjoy it. I used trying this out as an excuse to get a massage from my boyfriend - Score! This is a really interesting texture, because it's not greasy at all and feels somewhat like a dry oil to me, but does provide a nice lubrication for a massage. I actually used this to massage my own feet as well after a particularly long shopping trip in ill advised shoes and it worked really well and left my feet feeling hydrated as well, but not greasy. Probably the most exciting for me in this set because anything almond needs to get on my face. Or my body. Or my soul. Anyway, I did enjoy this, but it's not to my personal taste necessarily. It's a pretty rich cream and I found it a little bit too heavy on my skin for this kind of year. However, for someone with dry skin, this could be a dream. If there's one product from Weleda that I think is a must have, it's definitely Skin Food. I've actually been a huge fan of Skin Food for years and have recommended it constantly for ages now. I like to use this anywhere I have really troubled skin. I use it to soften my cuticles, deal with dry, cracked heels, and on my knees and elbows to keep them soft. I swear, this is a complete wonder product and I think anyone could benefit from it. I really, really like this, with only one small complaint. First, I absolutely love the scent, which is kind of a soft, bright floral that I honestly find that I can't really describe. I also love how it makes my skin feel. I don't necessarily feel hydrated the way I do with some other body washes when I get out of the shower, but my skin feels soft and I don't get any of the post shower tightness that I'm used to. The only problem with this for me is that I have to use quite a bit to be able to lather over my entire body and it seems to disappear from my pouf quickly. Still, I would definitely pick this up in full size. Overall, now that I'm trying more and more Weleda products, I'm really enjoying the brand and can't wait to try out some more. If Weleda releases another set similar to this one, I would definitely recommend picking it up to try out a selection of their products. 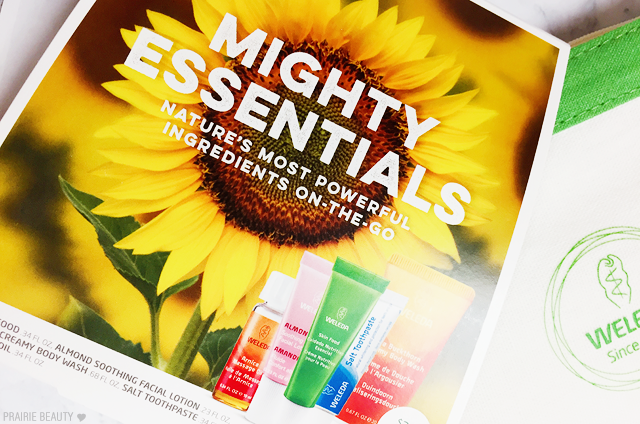 Currently I'm in the testing process of a few products from their Evening Primrose line, so look out for a review coming soon, but if you have any product recommendations from the brand I'd love to hear about them in the comments! 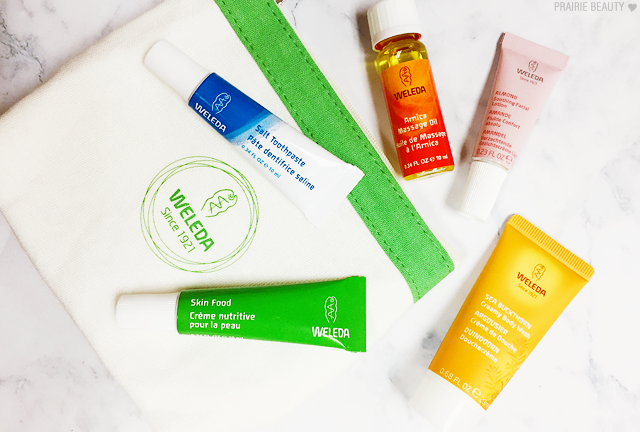 Weleda products are available online at Well.ca & iHerb.ca as well as at select local retailers!